AICC Vice-president Rahul Gandhi hit the campaign trail for the November 25 Assembly polls in Mizoram today, stressing on welfare of Mizo youths and promising to create more jobs if Congress is voted back to power in the state. Addressing an election rally at Kolasib town on the Assam-Mizoram border, Rahul said skill development will be Congress' priority to ensure that more Mizo educated youths find employment across the country. "We (Congress) will also create more jobs for youngsters in the state during the next five years if Congress retains power," he said. He promised setting up of a medical college after Mizoram University, National Institute of Technology and Indian Institute of Mass Communication started functioning in the state. Development of the sports skills of Mizo youths will be a continued priority of the government, he said, adding that "a number of Ronaldos and Messis (internationally renowned football players) will come up from the state." Besides construction of three stadiums with artificial grass in the state, a stadium each will also be constructed in every district. Gandhi lauded the achievements of the Congress government headed by Chief Minister Lal Thanhawla and said the New Land Use Policy (NLUP), the flagship program of Congress, has brought economic prosperity in the state. NLUP was a special project for which the Centre provided Rs 2,800 crore during the past five years. It benefited the youths and farmers specially by creating more jobs and increasing yield from land. Referring to the ongoing Kaladan Multi-Modal Transport Project, which will help direct export of products from Mizoram to Kolkata via Myanmar, Rahul said the government will also give special focus to roads, and every village in the state will be linked. Earlier in the day, the Congress Vice-president also addressed an election meeting at Champai town on Mizoram-Myanmar border. He was accompanied by CM Thanhawla, AICC General Secretary Luizinho Faleiro and three candidates from the district. Rahul left for Delhi after the Kolasib rally. At least 70 per cent poll turnout was reported from the six Bru relief camps in North Tripura district during the three-day polling for the coming elections to the 40-member Mizoram assembly, state Joint Chief Electoral Officer H Lalengmawia today said. Polling began on Tuesday last and concluded today in the relief camps of Naisingpara, Asapara, Hazacherra, Khakchangpara, Kaskau and Hamsapara, Lalengmawia told PTI. The Election Commission (EC) had instructed the state election department to conduct the polling in relief camps on November 19 and 20. However, the polling, which was conducted through postal ballots, could not be completed yesterday due to slow process of the exercise and the Commission granted permission to continue the franchise today, Lalengmawia said. The 11,612-strong Bru electorate in the relief camps were exercising franchise through postal ballots in the camps for the Mizoram polls to be held on November 25. Chief Election Commissioner V S Sampath, while visiting Mizoram recently had said Bru voters lodged in the camps in Tripura would be allowed to exercise franchise in the camps in accordance with the Delhi High Court order of 1999. Under fire from rivals for giving in to Hindu rituals, Mizoram chief minister Lal Thanhawla is now besieged by barbs for “importing” the Congress’ dynastic politics against the tenets of local tribal culture. The accusations have reached a crescendo with the day of polling, November 25, round the corner. Mizos did not give much thought to the candidature of the chief minister’s younger brother Lal Thanzara from Aizawl North-III seat in 2008. Thanzara, seeking re-election from the same constituency, ended up as the “de facto deputy CM” — a term the Opposition has coined — handling almost everything Thanhawla would normally have done if he did not travel “300 days a year”. Social media sites — offline Mizos too — began discussing the advent of dynastic politics after the Congress gave the ticket to Chalrosanga Ralte for the Lunglei West seat. Chalrosanga is the brother of Lalriliani, the chief minister’s wife. Chalrosanga is also the younger brother of Mizoram’s sports minister Zodintluanga, who is hoping to represent the Thorang seat again. That Chalrosanga was not in the reckoning even a few months ago set tongues wagging. If that weren’t enough, the Congress has retained Lt Col Zosangliana for the Aizawl South-II seat despite the “non-performer” tag. Zosangliana is the brother-in-law of Mizoram assembly speaker John Rotluangliana — party candidate for the Mamit seat as also of Lok Sabha member CL Ruala. 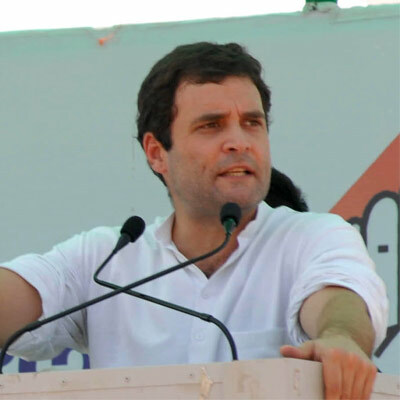 Congress vice president Rahul Gandhi on Thursday addressed a poll campaign rally in Mizoram, assuring the people that those from the state had "a friend in Delhi". In a short speech at Kolasib in Mizoram, the Gandhi scion said that he wanted to travel across the state like his father, former prime minister Rajiv Gandhi, and listen to the problems of the people. He further said that the Mizo accord is the best example of conflict management. Rahul's rally in the poll-bound state came four days after Prime Minister Manmohan Singh addressed a small gathering of around 600-700 people, canvassing for votes for the Congress. The Prime Minister referred to the advantage of the same party remaining in power, thereby indicating how Congress-ruled state and central government could work in tandem towards this. "I recall that 5 years ago I had said that if a Congress government came to power in Mizoram it would again implement the NLUP, which had been discontinued by the MNF government... I know that the state government has made some suggestions to make the scheme better and I promise you that the Congress-led UPA government at the Centre will provide all possible assistance to Mizoram to achieve this," Singh had said. 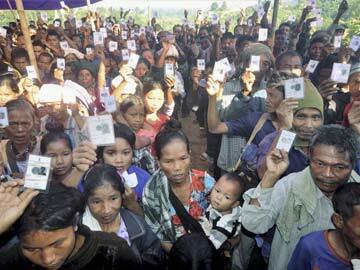 Mizoram, a special category State, is headed for rule by a government of crorepatis. Going by a study of the candidates’ assets, the only sure upshot is that the State is headed for a rule by rich men. Ruling over a State that’s known as a ‘poor’ State, the outgoing people’s representatives have done very well for themselves. The assets of 36 outgoing MLAs who are contesting again in the 2013 elections grew by a clean Rs 1.79 crore on an average. Analysed by the Mizoram Election Watch and the Association for Democratic Reforms (ADR) the candidates average assets growth is Rs 2.62 crore from the average Rs 82.81 lakh in the 2008 elections, a 217 per cent growth. Three chief ministerial hopefuls, Congress president and Chief Minister Lal Thanhawla, Zoramthanga, president of the Mizo National Front (MNF) and Lalduhawma, president of the Zoram Nationalist Party (ZNP) are all millionaires as per their affidavits. Congress president, Thanhawla, contesting from Hrangturzo and Serchhip constituencies has declared maximum increase in assets of Rs 6.92 crore; from Rs 2.22 crore in 2008 to Rs 9.15 crore in 2013. Zoramthanga, though not a sitting MLA has total assets of Rs 2.18 crore. Not reflected in the affidavit is that a case under the Prevention of Corruption Act has accused him of having assets worth Rs 800 crore without proper source of income. The assets of former IPS officer Lalduhawma, ZNP president and sitting MLA grew by 155 per cent from Rs 67 lakh in 2008 to Rs 1.70 crore in 2013. Retired Indian civil servant, and president of Mizoram People’s Conference (MPC) which is in poll alliance with the MNF, has assets of Rs 2.01 crore. ADR report says that 53 per cent, i.e., 75 out of the total 142 candidates are crorepatis. The average assets of the 40 Congress candidates is Rs 2.52 crore, ZNP with 38 candidates has an average of Rs 3.13 crore and the MNF with 31 candidates is an average of Rs 2.69 crore. At the other end of the spectrum are the candidates at the bottom of the assets line-up. There are 12 candidates with less than Rs 1 lakh assets with Bharatya Janata Party (BJP) candidate, Zoramchhani, a woman candidate having total assets of Rs 3,800 only. While the crorepatis woo voters, the average electorate remain hassled by issues of price rise of essentials, disappearance of domestic cooking gas from the agencies, the roads in disrepair, etc. The soaring wealth of their rulers are a far cry from the per capita income which was reported as Rs 30,488 in 2007-08 and rising to Rs 50,021 in 2011-2012. The Economic Survey 2011 reported that 60 per cent of the population of the State depended on agriculture but the sector contribution to the GSDP was only 19.84 per cent. The average ‘agriculturist’ in this mountainous State ekes out a tough living in the notoriously mountainous terrain. This is incidentally, where the political parties led by ruling Congress party are set into a formula wooing voters through ‘charity’ based schemes such as the New Land Use Policy (NLUP) or various versions of this through which money will be directly distributed if voted to power.